On the one hand, a brand that seems to have tapped into kids minds is promoting health and exercise and stuff. Getting kids to ride bikes with or without a helmet is a good thing – either way, it’s almost certainly better for them than not riding a bike. Or is this just more promotion of the Culture of Fear? ‹ Cycling: Glass Half Empty or Half Full? Helmets aren’t the only contradiction. 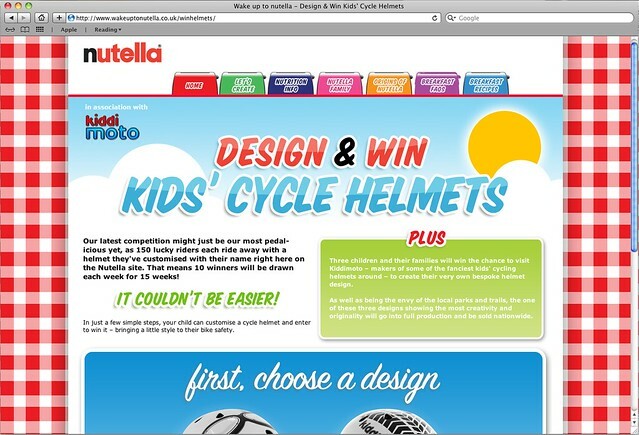 Nutella not only is “promoting health and exercise” but also their not terribly nutritious sugary spread for bread. This is just marketing. If your product looks bad, align yourself with something that looks good. It’s much like these people.